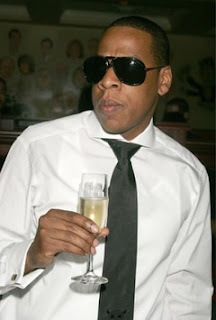 Ok Ok, I promise this is the last post about Jay-Z, but word on the street is that Jigga man lifted his ban on Cristal. A while back Jay had banned Cristal from being served in his clubs because of racist comments made from the makers of the expensive champagne towards the hip-hop community. We seen him politely declining a bottle of Cristal in his video "Show me what you got" for his new drink of choice "Ace of Spades" well things may have taken a turn because guests were adorned with bottles of Cristal at Tocarra's 25th birthday party this week and Jay AND B along with the rests of the guests were toasting the bubbly all night lonnngggg! I wonder what made him change. so in other words- he sold out. I read he didn't drink any and he was mad at the NYDAILYNEWS for saying he did in the story. Either way no one was there to see if he did or didn't and I'm sure he did take a little sip sip because that Ace of Spades is nasty as hell. On my side you're welcome to drop in on my site since this is the website with extremely valuable stuff to go to see.Very much thanks for post.